Covering the history of the helicopter from it's inception right through to the killing machines and rescue choppers of today, this documentary is great viewing. The thing I like the best about the Discovery Channel docos is that they don't run so long that they are boring. They are concise, entertaining and to the point. 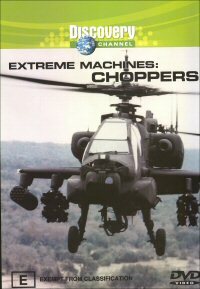 There are so many details about choppers here and how they work (or don't) that I would never have imagined. From the first attempts at flight, to troubles with torque (the fact that the body of the chopper wants to spin as well as the rotors themselves), to the design of the of the rear rotor that balances out the torque of the machine. We get to see choppers prepare for combat and how they fly low to avoid radar and surprise enemies. Live firings at targets are also included. A variety of commentaries from the people who use these machines in their day to day work is also included and it makes for a nice change from the narrator. Get onboard with a rescue crew and see how these nimble craft operate when saving someone who has fallen down a cliff face. The helicopter has been the greatest invention in terms of it's ability to save human life as well as take it. I was flabbergasted at the ability to carry huge loads including trucks by some of the larger choppers, their awesome capabilities were inspiring to behold. I'd heartily recommend this title, it's entertaining, informative and best of all, cheap as chips to buy. You can get most of the docos from Discovery Channel through Magna Pacific for about the $15 mark which means there is no excuse for folks and schools not to pick them up.